You may be surprised one day to notice that your children's teeth have turned a yellow color. Because they are young we expect their teeth to be bright white since they haven't lived long enough for stains to start turning teeth a yellowish color. However, children's teeth are still forming their enamel and are susceptible to turning yellow from a variety of factors. If your child has ingested too much fluoride during his or her tooth-forming years it may lead to fluorosis. This irreversible condition occurs when fluoride damages the enamel-forming cells and results in a mineralization disorder that increases the sub-surface enamel. A porous surface will cause the teeth to turn a yellow color. Sometimes children will take an antibiotic medication that contains tetracycline. If they are young enough and their teeth are still forming this can cause the enamel to stain. This reaction can turn an entire tooth yellow or it may result in yellow patches or ribbons on the tooth. How severe the discoloration has to do with the duration and exposure to tetracycline. This medication is rarely prescribed for children under the age of eight and the only way to remove the stains is through bleaching techniques. Another cause for a child's tooth to turn yellow is trauma. If your child has sustained damage to a nerve in or near a tooth from an accident then there is a chance of a yellow stain occurring. This discoloration will only occur in the tooth or teeth that the damaged nerve is attached to. If your child has a yellow or gray tooth that is a result of trauma you should schedule a visit to your pediatric dentist for professional attention. 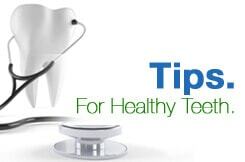 What your child eats and drinks and how well they brush and floss can also lead to teeth becoming discolored. By discouraging a diet that is heavy in highly pigmented food and drinks and encouraging proper flossing and brushing techniques you can help keep your child's teeth bright and white.